There is no combination of settings in Knife Tool Modal Map section which would allow to solve this issue and make non-MMB based viewport navigation function in Knife tool mode. 1, In factory default setup Blender, got to edit mode of the default cube, activate Knife tool using K key, and notice MMB to orbit, Shift+MMB to pan and Ctrl+MMB works. 6, Enter Knife tool mode, and notice that Alt+LMB and Alt+RMB do not work to Rotate or Zoom the viewport. 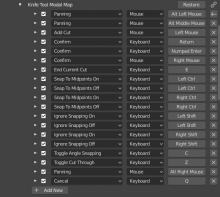 7, In Keymap editor, under 3D View>Knife Tool Modal Map, notice there is no possible setup to make these new navigation hotkeys work. Result: There is no way to configure Knife Tool Modal Map so that viewport navigation in Knife Tool Mode works with any other mouse buttons than MMB. Expected: It is possible to configure Knife Tool Modal Map so that it works with non-MMB based viewport havigation configuration. This has been a known limitation for a long time. Navigation while using modal tools in general is not supported besides some hardcoded exceptions. I found a workaround that makes the navigation with Alt + LMB/MMB/RMB possible while using the Knife Tool. In Keymap -> 3D View -> Knife Tool Modal Map you need to have Panning set for Alt+LMB, Alt+MMB, Alt+RMB. Are you 100% sure this works even if the view3d.rotate action is set to "Click-Drag", not "Press"? EDIT: Yes, exactly as I anticipated. You were not paying attention and did not read the problem is related to view3d rotate being set to "Click-Drag", not press. So your "workaround" does not solve anything in this case. You're right. It doesn't work when it's set to Click-Drag. But it's fine for the Industry Compatible Keymap, where select edge loops is done with double left click. In the current state of the Industry Compatible Keymap you can't navigate at all when the Knife tool is enabled.